← What did Rep. Stupak really say? Around a thousand people (so it seemed at least) sent me links to and texts of a speech given by a French bishops, H.E. Most Rev. Marc Aillet, Bishop of Bayonne. Bp. Aillet had been the vicar general of the French Diocese of Fréjus-Toulon, which you may recall has a seminary for the training of men in both Extraordinary as well as the Ordinary Form, a diocese where the men can choose with which rite, pre-Conciliar or post-Conciliar they desire to be ordained (I hope I am right about that, btw.). Bp. Aillet has given a talk entitled, "Wounded Liturgy", found in Italian on Messa in latino and given a quick translation on NLM, who did us all a service in posting it for English readers. I don’t have the time at the moment to work up an English version, but here is the NLM version, rough in spots, with my emphases and comments and few items tidied up. The French is here. Keep in mind, as you read, that Pope Benedict has communicated in several concrete ways that we must revitalize our worship in order to revitalize our Catholic identity. I think he has what I compare often to a "Marshall Plan" for rebuilding our identity in the wake of the devastation we have experienced as a Church for the last few decades. At the origin of the Liturgical Movement was the will of Pope Saint Pius X, especially in the motu proprio Tra le Sollecitudini (1903), to restore the liturgy and make its riches more accessible in order for it to become again the source of an authentically Christian life, to underscore the challenge of a growing secularisation [which is a major concern of WDTPRS] and to encourage the faithful to consecrate the world to God. Thence, the conciliar definition of the liturgy as "source and summit of the life and mission of the Church." Against all expectations, as has often been pointed out by Pope John Paul II and Benedict XVI, the implementation of the liturgical reform has sometimes lead to a kind of systematic desacralisation, while the liturgy was allowed to become ever more pervaded by the secularised culture of the surrounding world, thus losing its own nature and [wait for it…] its identity: "This mystery of Christ the Church proclaims and celebrates in her liturgy so that the faithful may live from it and bear witness to it in the world" (CCC 1068). The primacy that Benedict XVI intends to give the liturgy in the Church – "Liturgical worship is the supreme expression of priestly and episcopal life," [Therefore Summorum Pontificum – which frees the use of the older forms of worship – is of huge importance in Benedict’s "primacy".] 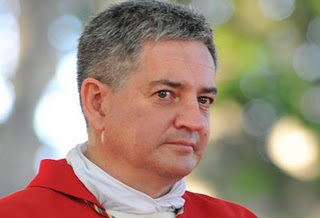 he told the bishops of France gathered in Lourdes on September 14, 2008, in an Extraordinary Plenary Assembly – wants to put adoration back at the center of the life of the priest and of the faithful. Instead and in place of "secular Christianity" that has often accompanied the implementation of the reform of the liturgy, Pope Benedict XVI intends to promote a "theological Christianity" , the only one able to serve what he has called the priority that predominates in this phase of history, i.e. "to make God present in this world and to give people access to God" (Letter to the Bishops of the Catholic Church, March 10, 2009). [I wonder if it wouldn’t be better here to say "theocentric Christianity"? Worship which presents first and foremost God as transcendent, Christocentrism uniting the transcendent and immanent. ? ? But get this next bit…] Where, in fact, better than in the liturgy, does the priest deepen his identity, [identity! Therefore, when the priest also gets the provisions of SP straight, his identity is touched.] so well defined by the author of Hebrews: "For every high priest taken from among men, is ordained for men in the things that appertain to God, that he may offer up gifts and sacrifices for sins. "(Heb 5, 1)? This certainly will be possible through a more rigorous observation of the liturgical norms that preserve the priest from the requirement, even the unconscious one, to draw the attention of the faithful on his person: [The older form of Mass favors this more than the newer form, but celebrating the newer form versus Deum, ad orientem, would help immediately and profoundly.] the liturgical ritual which the celebrant is called to receive filially from the Church in fact allows the faithful to come more easily to the presence of Christ the Lord, of which the liturgical celebration must be a telling sign, and which must always come first. The liturgy is wounded when the faithful are left to the arbitrariness of the celebrant, his quirks, his personal ideas or opinions, to his own wounds. Hence also follows the importance of not banalising the rites which, [the rites…] tearing us away from the secular world and thus from the temptation of immanentism, [the rites are supposed to tear us away from the worldly and over-stressing of the immanent.] have the gift [This next part will sound very familiar to anyone who has read anything I have written or said in conferences for the last few years…] to immerse us suddenly in the Mystery [! "encounter with MYSTERY" which is fearsome and alluring!] and open ourselves to the Transcendent. In this sense, one can never stress enough the importance of the silence preceding the liturgical celebration, an inner narthex, where we are freed of the concerns, even if legitimate, of the secular world, in order to enter the sacred space and time where God will reveal his Mystery; [Think of Moses, placed by God behind a cleft in the rock in Exodus 33!] [sc. one can never stress enough the importance] of silence in the liturgy to open oneself more readily to the action of God; [i.e., active participation is active receptivity] and [sc. one can never stress enough] the appropriateness of a period of thanksgiving, integrated or not into celebration, to apprehend the inner extent of the mission that awaits us, once we were back in the world. The obedience of the priest to the rubrics is also itself a silent and eloquent sign of his love for the Church of which he is but the minister, i.e. the servant. Hence also the importance of the formation of future priests in the liturgy and especially in the interior participation, without which the outward participation advocated by the reform [again, participation is first interior and then it comes to external expression] would be soulless and would favor a partial understanding of the liturgy that would express itself in terms of excessive theatricalisation of the roles, reductive cerebralisation of the rites and abusive self-celebration of the assembly. [self-sufficiency… the closed circle… etc.] If active participation, which is the operating principle of the liturgical reform, is not the exercise of the "supernatural sense of faith," the liturgy is no longer the work of Christ, but of men. [Another fruit of the modernist tree.] Stressing the importance of liturgical formation of priests, Vatican Council II made the liturgy one of the main subjects of ecclesiastical studies, avoiding reducing it to a purely intellectual formation: in fact, prior to being an object of study, the liturgy is living, [I think we need to use the word "worship" more often than "liturgy"…] or rather, is "to transcend one’s own life to merge into the life of Christ." It is the ultimate immersion of all Christian life: immersion in the sense of faith and in the sense of the Church, in praise and in adoration, as in the mission. We are therefore called to a true "Sursum corda". The phrase from the preface, "lift up your hearts", introduces the faithful to the heart of hearts of the liturgy: Christ’s Passover, that is, his passing from this world to the Father. The meeting of the Risen Jesus with Mary Magdalene on the morning of the Resurrection, is very significant in this sense: with his "Noli me tangere" Jesus invites Mary Magdalene to "look to the realities of the highest", making her realise in her heart that he is not yet ascended to the Father and requesting her to go and tell his disciples that he must go up to his God and our God, his Father and our Father. The liturgy is exactly the place of this elevation, this stretching towards God which gives life a new horizon, and thereby its decisive orientation. Provided that we do not regard it as material available to our all too human manipulations, but that we observe, with filial obedience, the prescriptions of Holy Church. As Pope Benedict XVI stated in the conclusion of his homily on the Solemnity of Saints Peter and Paul in 2008: "When the world as a whole will have become liturgy of God, when in its reality it will have become worship, then it will have achieved its goal, then will it be safe and sound. WDTPRS kudos to Bp. Aillet. Imagine how alone he is in his conference. Support him with a prayer before clicking away from this page? This entry was posted in Brick by Brick, Our Catholic Identity, SESSIUNCULA, SUMMORUM PONTIFICUM and tagged Bayonne, Bp. Aillet, Marshall Plan, wounded liturgy. Bookmark the permalink. 22 Responses to Hey bishops! Priests! A French bishop who really understands worship! Read… learn. He so succinctly explains my feelings about what has happened in the pews. Those that have been graced with such knowledge of HIS TRUE PRESENCE IN THE EUCHARIST and have a deep relationship with HIM, have been struggling for years trying to express our frustration to the hierarchy of the Church. And I’m not talking about the need to jump on a ‘rad-trad’ bandwagon, change back the Liturgy. I’m talking about the need to push all distractions and feelings out of our hearts and minds in that moment of the True Sacrifice of the Mass. Have our complete moment WITH HIM….just as two lovers that have finally found each other and work so diligently to be with each other. When this time/moment begins or is finally acknowledged, I believe that the world WILL know HIM and I pray that the ‘REAL’ change will have taken place! ALL TO HIM! Today,I wrote Bishop Aillet a thank you note and prayed for him last night, after reading the talk. I used this email address(it has not ‘bounced’) from the diocesan website -http://tinyurl.com/yzxuakc – sdic64@wanadoo.fr and I used the Google Translate to translate my note. Also,I plan to print it off and share with the local clergy. Prayers for ALL Priests and Bishops! One more thing…it was such a huge consolation to find and read it on the ‘day-after’ the HC vote. I agree that Sommorum Pontificum is a gift to priests, and I look forward to the day that I will be able to celebrate the Holy Sacrifice according to the old rites, but I’m not even close to being able to do that. When I was in seminary, no courses in Latin were offered, and hence I have no Latin (and if I ever wish to be able to celebrate in the EF I have to self-teach Latin). There currently in my diocese is a board which determines suitability for a priest to be able to celebrate in the EF. They test for the ability to pronounce and understand the Latin, the understanding of the 1962 Missal Rubrics, postures, ritual actions, etc. Only if you pass may you celebrate publicly in the EF (possibly privately too). As a busy pastor, it could take awhile to get to the point where I can do this (I need a workshop/sabbatical to get properly trained and prepared for the EF). That said, I believe that the Ordinary Form, the Paul VI Mass can be celebrated in away that is reverent, and brings about the sense of mystery, and the transcendence of God. The OF Mass is a valid Mass, and celebrated properly and faithfully, it can accomplish what we would all like to see, a recapturing of Catholic Identity, and a recapturing of the sense of the sacred. While the EF does this so well, the OF can as well, if celebrated faithfully according to the liturgical norms set forth in the GIRM, no additions, no deletions. It is a say the black and do the red type of thing. Ultimately it is the obedience and faithfulness of the priest to the Liturgy as given us by the Church, and the witness that that gives to the people, that sends the message about the seriousness of what we, or rather what Christ is doing, at the Altar. So, I continue to celebrate the OF Mass according to the Liturgical norms set forth by the Church faithfully (I pray), and long to one day be qualified and able to celebrate the EF Mass as well. This Bishop is only 52 years old! May God bless bishop like him!! Unfortunally isn’t all bishop that act and think like him. Here in Brazil more than the secularism we also have a bonus, something called: Liberation Theology (is a prague). Here in my diocese you can celebrate country mass, african mass, you can clap you hands, you can make a play inside the mass, you also can sing song from protestants churches (including on the moment of Holy Communion), but the bishop strictly forbid the mass in Latin. He said that we couldn’t use any of the churches in the diocese and said that no priest was allowed to celebrate in latin. So people who think that you are in a bad situation, you can imagine what sort of things happen down here. Translation issues aside as New Sister pointed out, I think this is a reference back to Sacramentum Caritatis, in which Pope Benedict XVI’s teaching attemtps to “put an end to the controversy of faithful seeking to protect themselves excessively from the world” in the liturgy by pointing out that participation in the liturgy is inextricably linked with the whole of daily life. I think it’s that connection to which Bishop Aillet is referring; namely, liturgical participation is not just awareness of, and entering into, the sacred mystery in the celebration as though one can take refuge there to the exclusion of the world, rather it also has to do with the way in which the mystery influences our activity in the world going forth; hopefully in a way that consecrates all to God. Who said that the Church of France is dying? Does the “Paschal Mystery” model of worship mean putting too much emphasis on the ressurection and not enough on the crucifiction? A very good read that gets to the heart of the matter. And liking the read gets me to thinking. Am I a rad-trad, or conservative, or something else I do not know yet. Why must we have the labels? It seems the whole Church should be recognized as traditional, for we are supposed to carry forward what came before, pretty simple. In a home there is traditional style, and the opposing. Modern. One is often viewed not in harmony with the other but as opposed to it. How do we reconcile this when Liturgy or Worship is categorized this way? There will always be opposition. The bigger picture should be that we as Catholics belong to a Traditional Faith in a modern society. For modern religions people whould go elsewhere and often do. Viewing the whole Catholic Church as a religion steeped in Tradition will obliterate the two opposing viewpoints and should eliminate the goal of “modernists” (a label I have come to know) to modernize the Church through their lens because the faithful will know that they belong to a traditional Faith in general. The Church has numerous times stated that without tradition she falls, or things along those lines. Allowing the 2 sides to coexist seems unnatural. It is like traditional wood furniture with a chrome and glass coffee table in the middle of the room. If Rome has said we are a traditional Faith, period, then when people walk into their “home” they would not expect to see nor push for chrome and glass. For those who would think this too extreme I am not saying that on the traditonal furnishings may not rest a small, modern looking frame or vase. But the overwhelming feel should be traditional, and there is nothing wrong with stating that if we have been defined as that by centuries of Peter, leading our Faith. Why should an overwhelming “modern” feel be allowed to try to co-exist anyways if that is not predominantly what we are about? There’s nothing wrong with chrome and glass, as long as it’s made to fit in with the wooden furniture. After all, there are hundreds of different styles of wooden, golden, and bronze chairs in the house. “Those wooden chairs and that golden throne don’t fit in” “They have to go”…Mine was a metaphor for tradition and what has always been done. Your suggestion will look fine in a Protestant home. Perhaps you did not understand my train of thought…Glass and chrome representing modernism. Discussed thoroughly by quite a few Popes it does not fit. That is what is wrong with it. How wonderful to have this clear light from within the French hierarchy: authentic, clear, orthodox. There is a paradox within French Catholicism (not unlike their politics): there coexist this sort of quality, but also elsewhere a stubborn refusal to move from a patently failed 70s path which has reduced the Church in France almost to a remnant in places. Green shoots here, though. They will grow, I am sure. There is still much holiness and fervour in France. It just needs liberating. Bravo, M. l’Eveque! May I add that a wounded liturgy that has been (ironically) e-Masculated and de-Divinized in this way, in turn critically hurts us, the faithful. That’s what happens when one partakes of sterility–at any level of being. Vive M. l’Eveque! He’s got it right! Bishop Aillet is actually quite alone in the French bishop conference, in which he surely has strong enemies. He regularly issues press releases to defend the Church and the Pope: most recent ones on the child abuses in the Church, on planned increased state funding to doctors performing abortions, on the motu proprio and its implementation in his diocese, on the local gay pride (which prompted some strong reaction from the local politicians as one would expect). He has set up 2 permanent adorations in chapels in Pau and Bayonne. He’s a fantastic bishop and needs all our prayers. The next bishop of Tarbes-Lourdes? That would be the test. Then, off to Paris as the Cardinal Archbishop.